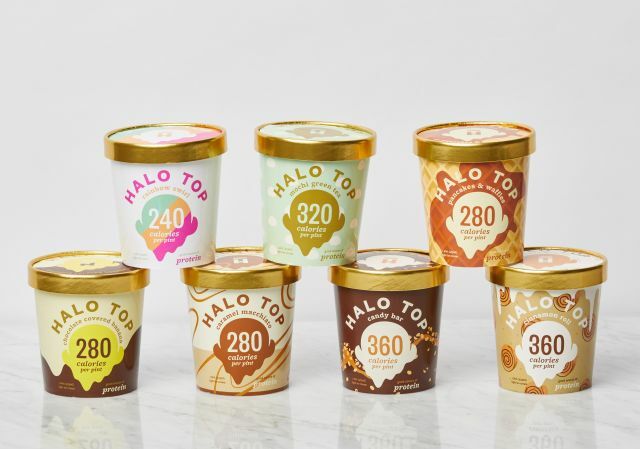 Halo Top Creamery plans to roll out seven new flavors later this month to their line of low-calorie, low-sugar ice cream. - Pancakes & Waffles - With pieces of pancakes and waffles, plus a maple syrup swirl. - Cinnamon Roll - With chunks of doughy cinnamon rolls swirled with cinnamon icing swirls. - Mochi Green Tea - Green tea ice cream with mochi bites. - Rainbow Swirl - Orange, lime, and sweet raspberry ice creams. - Candy Bar - With peanuts, chocolate, and caramel swirls. - Chocolate Covered Banana - Banana ice cream swirled with milk chocolate. - Caramel Macchiato - Coffee ice cream packed with caramel ribbons. Each of the seven new flavors range from 240-360 calories and include 20 grams of protein per pint.